I've finished the background for my Scrappy Dresden, added all the large Dresdens. Now I'm pondering a color for the mini Dresdens. I was leaning toward aqua, but a peek in my aqua bin made me second guess that decision. Most were not wide enough for what I want to do. Those that were seemed darker than what I wanted. So I might have to rethink this. Maybe yellow. While I mulling that over in my mind I'm having a little fun quilting some waving lines in my quilt featuring Jen Kingwell's latest line.I do love how it is looking.Some times the simplest quilting has the greatest impact. It's Monday and you know what that means. A chance to share what you've been working on, and be inspired by what everyone else is moving along. Link up and share. love the bright colors against the black and neutrals. Wonderful Dresdens. I like how you go with the scrappy flow and can change direction from your first thoughts. And I'll have to keep the wavy matchstick lines in mind. I might be able to handle that on my DSM and I like the way it looks. Your dresdon quilt is wonderful. I am all about coordinated scrappy. Yellow will look great, but I can see why you wanted aqua. Yay! You are working on another finish with your quilting. sometimes I think I could get so much more done if I didn't quilt my own, but I just don't want to pay someone else to do mine and worry I won't like it. Em I love those wavy line. Thanks for the link up. Time to shop for some aquas. I would be hard put in the aqua section myself. Dresdens are my favorite design and I like how you set them on a pieced background. But is that going to make it harder to quilt because of the bulk? I do like your wavy line quilting too. That seems like something I would be able to do with my walking foot. 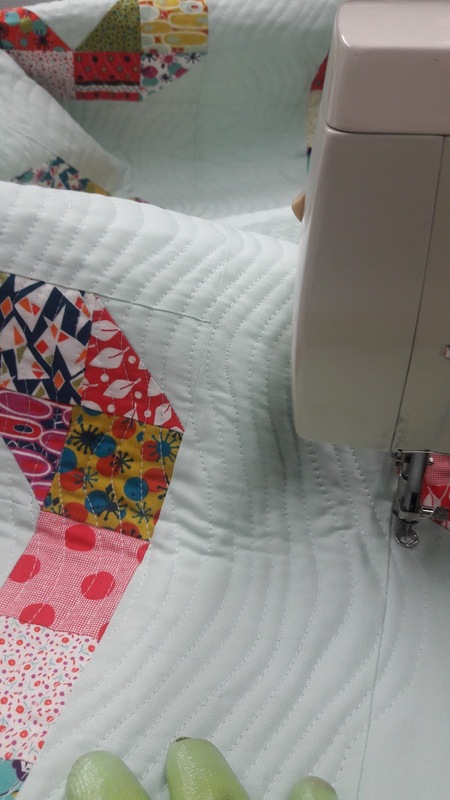 When doing this type of quilting, do you start in the middle and work out to the sides? Also, I don't see any basting pins. 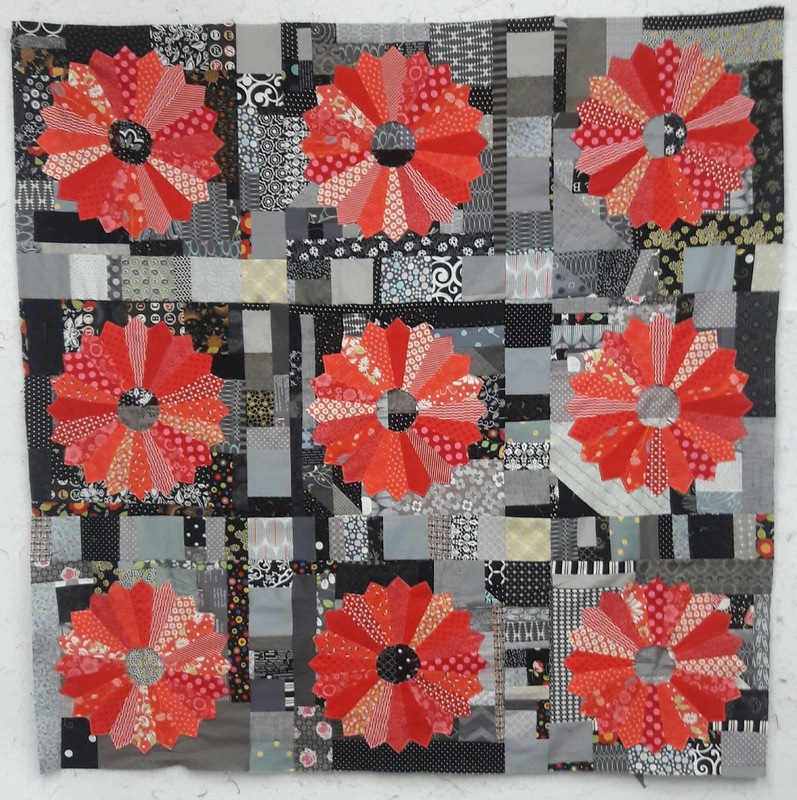 When I put applique on top of a pieced background, or when I do stacked applique, I trim away the bottom layers carefully after stitching the applique. That makes less bulk to quilt through and also keeps the applique from becoming too stiff. And it doesn't "weaken" the quilt one bit as long as your applique stitches are small and even, the same as your patchwork seams. Your Dresdens look amazing. I know we're supposed to be all about using scraps here, but you've been SO GOOD... I think you should give yourself to buy a couple FQs of aqua for your smaller Dresdens. I love red with aqua. And you've put so much effort into this; if aqua is what you see in your mind's eye, aqua is what your quilt should have. In fact, I have half a mind to go upstairs to MY stash and dig out some aqua fabric for you. Do you have a local quilter friend who might swap some aqua from her stash for something from yours? This one is a beauty! Where are you planning more dresdens? Or is it the centers you're rethinking? Best bet is to throw what fabric you have on it and see what has the greatest WOW factor. It's already got a great start! Your dresdens are fun! Makes me want to try a few more myself--it's been so long. Your dresdens and their scrappy backgrounds are lovely. I think I’d buy or trade a bit of aqua, too. But going through the stash again is another good plan. It’s interesting to see what different things pop up. 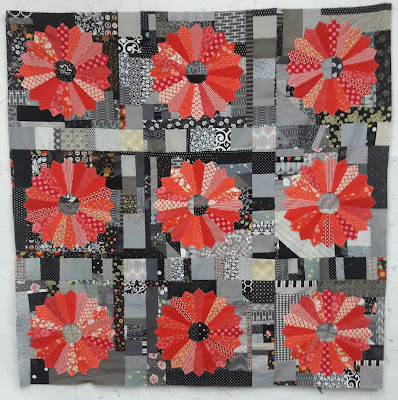 I am a big fan of the Dresden quilts, especially red...absolutely lovely! Oh, how I love Dresden plates! So beautiful! Your quilt is lovely! Those are so pretty. I think yellow would be fabulous. Hi. I'm new to the party. Do you have a blog button for your linky party?